The image below of the shadow of a super massive black hole in the M81 galaxy, over 53 million light years away, is an astounding accomplishment. Congratulations to the entire Event Horizon Telescope team. The ring of light surrounding the M87 super massive black hole has a diameter of about 50 micro arc seconds. To understand the incredible resolution of this image we can calculate how large an object with this angular size would be on the Moon and compare that to the results obtained with the best optical telescopes on Earth. 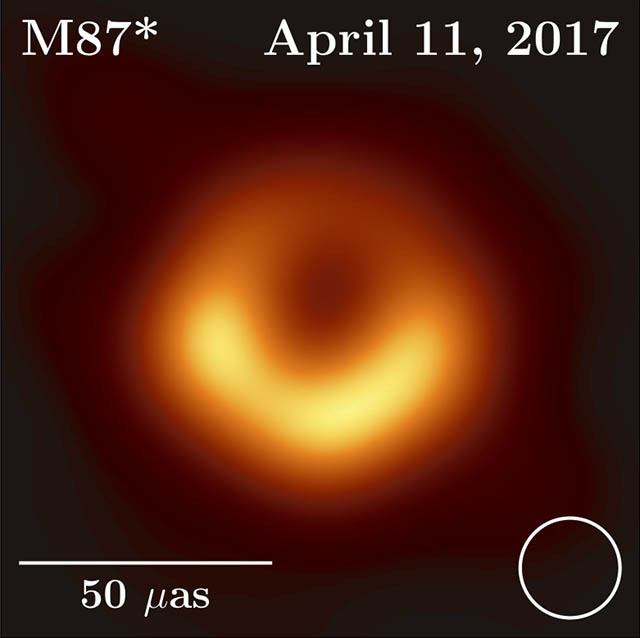 Image from the Event Horizon Telescope Collaboration et all 2019. The tangent of a small angle is approximately the same as the angle in radians. The Moon is 384,400 km from the Earth. The best telescopes on the Earth’s surface can only see features about 1km on the surface of the Moon. The image of the M87 black hole, is the equivalent of taking a picture of a doughnut on the surface of the moon! This is more than 10,000 times better resolution than the smallest feature observable with a conventional optical telescope on the Earth. The Lunar Reconnaissance Orbiter Camera (LROC) orbits the moon coming as close as 31 miles to its surface. The highest resolution LROC images have a resolution of 0.5 m. This is enough to capture the large equipment left behind on the moon, but not enough to see a doughnut on the surface. An animation of LROC images of the Apollo 11 landing site from lunar dawn to dusk. Amazing, that we can see something 50 million light years away so much better than we can see our own moon!